US And Allies Put On A Good Show In Syria, But Did They Launch $100 Million Worth Of Missiles For Nothing? In a tightly coordinated operation late April 13, the U.S., Britain and France launched a combined 105 missiles at three targets inside Syria thought to be critical to President Bashar al-Assad’s chemical weapons program. A response to the Syrian regime’s suspected chemical attack on civilians, the “precision strikes” were meant to deter Assad from any further use of internationally banned weapons. By taking out the three facilities — the Barzah research and development center in Damascus and two storage bunkers near Homs — the allies had cut out the heart of Syria’s chemical weapons production capability, defense officials said. President Donald Trump was effusive in his praise for the operation, calling it “perfectly executed” in a tweet on Saturday. “Could not have had a better result. Mission Accomplished!” Trump wrote, evoking memories of former President George W. Bush’s fateful announcement about the end of combat operations in Iraq in 2003. Outside assessments paint a different picture of how effective the strikes were at degrading Syria’s chemical weapons program. In the case of the Barzah research facility, which was completely destroyed in the bombardment, eyewitness accounts and independent reports undermine U.S. claims it was a critical site for the production and testing of chemical weapons. Just hours after the strikes ended, correspondents for Agence France-Presse toured the collapsed ruins of the Barzah facility. There, an engineer who was escorting the AFP reporters insisted only non-lethal research and development was conducted at the site. “As we work in civilian pharmaceutical and chemical research, we did not expect that we would be hit,” said the engineer, who was identified only as Sayed. “If there were chemical weapons, we would not be able to stand here. I’ve been here since 5:30 am in full health — I’m not coughing,” Sayed added. Later Saturday, Sayed reportedly spoke with CBS News correspondent Seth Doane, the lone American network journalist inside Syria. Allied assessments that chemical weapons were being developed at the Barzah facility were “totally incorrect,” he told Doane. “The Organization for the Prohibition of Chemical Weapons (OPCW) visited here and didn’t report anything wrong with this place,” Sayed said, according to CBS. An employee of the Syrian government, Sayed was expected to echo Assad’s boilerplate denials of chemical weapons development. It is also possible the Syrian regime moved evidence of chemical weapons research from the Barzah facility in the week between the April 7 attack and the allied strike. Still, Sayed’s account aligns with the findings of OPCW inspectors who toured the Barzah site in November 2017 as a part of the agency’s ongoing investigation into the Syrian government’s chemical weapons program. The team inspected Barzah and another facility and found no red flags to suggest either was being used to make chemical weapons, according to a report prepared for the OPCW executive council. “The analysis of samples taken during the inspections did not indicate the presence of scheduled chemicals in the samples, and the inspection team did not observe any activities inconsistent with obligations under the Convention during the second round of inspections at the Barzah and Jamrayah facilities,” the report stated. 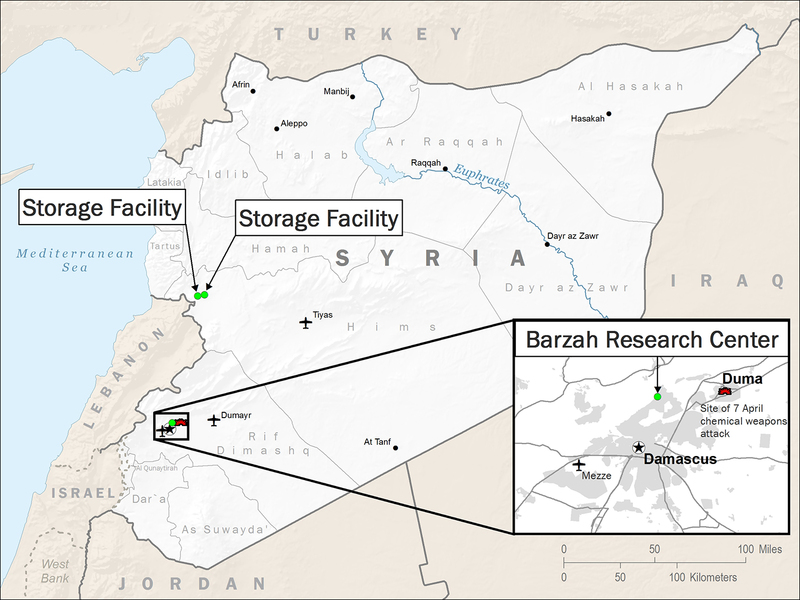 Even if Barzah was a critical node in Sryia’s network of chemical weapons facilities, its destruction probably didn’t do much to hamper Assad’s ability to deploy the prohibited substances, experts say. That’s because Syria’s chemical weapons stockpiles are scattered across dozens of sites, and hitting just three is unlikely to have a long-term effect. “That claim that Syria was set back for years is pure PR,” Jeffrey Lewis, an arms control expert and former U.S. defense official, told CNBC on April 15. Israel, which has also kept close watch on Syria’s chemical weapons capabilities, is also skeptical the allied strikes “sent a very strong message to dissuade” Assad, as Defense Secretary Jim Mattis claimed April 14. The fact there were no reports of leaking chemicals in the aftermath of the attack suggests no major stockpiles were hit, a senior Israeli defense official said Tuesday. The limited nature of the allied strikes stemmed from concerns among U.S. defense officials a larger response would hit Russian troops or military assets embedded with Syrian forces. Mattis, in particular, has cautioned against any action risking direct military confrontation with the Russians, which could provoke a deadly response and draw the U.S. deeper into the Syrian war. In the end, a targeted, largely symbolic strike may have been the only military option available that didn’t carry an unacceptable risk of starting a larger war. Short of a massive attack on the entirety of Syria’s defense infrastructure, there was no way to guarantee Assad would be deterred from using chemical weapons again, according to Mattis. “Nothing is certain in these kinds of matters,” he told reporters after the strike.